Now that social networking has become mobile, entrepreneurs are rapidly finding ways to leverage this “mobile networking” to boost their businesses. Foursquare, a virtual guide to the places and spaces nearby, is the most popular location-based mobile app with 7.5 million users in only two years. 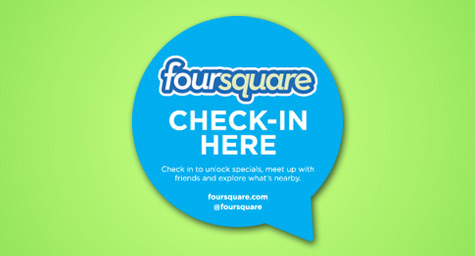 Foursquare lets users “check in” at local businesses through its smartphone app, which allows consumers to share their locations with friends and collect points and virtual badges. Many will travel far to visit a local business for deals and freebies, while others participate to gain credibility among their networked friends. For entrepreneurs, the benefit is having their business discovered by crowds of cyber-conscious consumers. Now, successful users are sharing how they built their businesses by the force of Foursquare. 1. Make Generosity A Priority – How did P.Y.T in Philadephia became one of the most visited restaurants in the country within the Foursquare community after only opening in August 2010? After the owner noticed patrons “checking in” on their smartphones, he offered his first Foursquare deal of a free beer for checking in. The response to the generous deal was dramatic and the eatery earned its 5,000th check-in after a few months. In February, the eatery logged 10,000th check-in. While the venture has cost 11,000 free beers and counting, the owner says the expense has paid for itself tenfold since most visitors come in for more than a free beer. The eatery plans to continue this deal with the belief that the more generous you are, the more you’ll be repaid by appreciative customers. 2. Keep Offering Incentives – A Pots & Pans Production, which manages seven restaurants in Indiana, offers a standard 10% discount during the week for visitors who “check in” at one their restaurants. The company also frequently hosts creative events where visitors can come in and compete for badges. On the days of these events, sales can double and some events even earn media attention. The company has found this to be the best way to get customers into the restaurants and avoid the issue of people “checking in” at the location without coming inside. Apparently, consumers don’t necessarily need to come inside to “check in.” Only their location coordinates must match up, which is why the number of “check-ins” isn’t always an accurate measure of traffic. By hosting these events for real rewards, visitors actually come in and their “check-ins” pay off for businesses. 3. Recognize Your Customer – Marmalade, a San Francisco-based clothing boutique, is trying to attract more customers by offering a 10% discount to anyone who “checks in” at the store. In addition to helping ring in sales, the owner finds Foursquare to be a valuable way to track customers. By knowing who has checked in, she can reward these loyal customers with sales, discounts and advance notice of new arrivals. She also hopes to be able to track the effectiveness of her new Foursquare discounts to glean even greater insight into her customer base.